The first weekend of the NCAA Tournament is in the books. 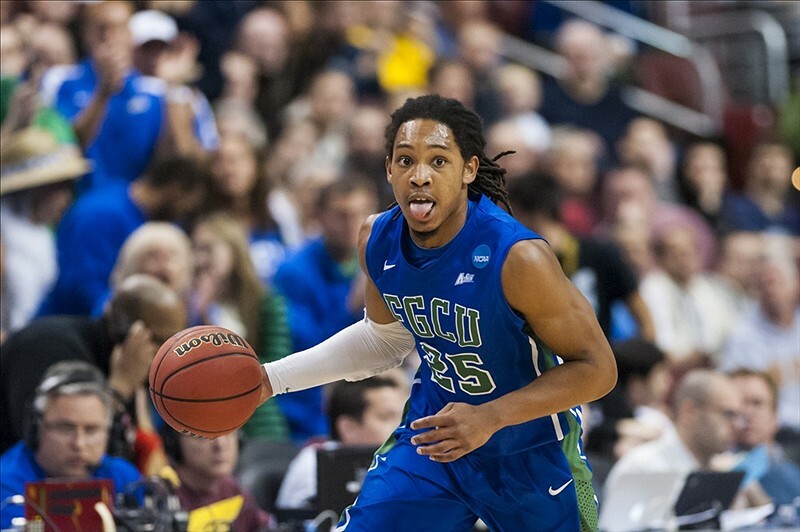 With the parity in college basketball, it shouldn't be a surprise that the stories of the tournament thus far are Florida Gulf Coast and La Salle. The Rounds of 64 and 32 delivered with dramatic endings, memorable games, feuds between analysts and conferences, and enough screengrabs and GIFs to last a lifetime. What stood out most from the NCAA Tournament's first weekend and the coverage for March Madness? Let's dish out some awards! Best Booth: Ian Eagle and Jim Spanarkel. Eagle's been a name on the rise for some time and is in the process of breaking through to that upper echelon of play by play men. But Spanarkel deserves praise too. His color commentary won't be made into hashtags anytime soon, but he breaks down the game clearly and concisely, and perhaps most importantly – he has great chemistry with Eagle because the pair have called college and pro games together for years. Bill Raftery is entertaining, but sometimes his fun-loving pairing with Verne Lundquist goes off the railroad tracks. MY GOODNESS!! Marv Albert and Steve Kerr were another contender in this category, but on occasion there were a few slips with players and game situations. Eagle and Spanarkel were just a bit more consistent, and it's a shame they won't see action on the second weekend. Best Studio Analyst: Greg Anthony. While most of the attention has been on Turner's NBA guys (more on them later), Anthony thankfully delivers some sanity and perspective. And with Kenny Smith and Charles Barkley really only able to talk in generalities and struggling once again with basic knowledge of the teams and players involved, Anthony has to pull even more weight in the main New York studio. Most Polarizing: Doug Gottlieb. His volatile performance on Selection Sunday was the talk of the Twitterverse and it was the same story this weekend. The former ESPNer is the most notable addition to this year's tournament coverage and he's either the best or worst thing that's ever happened to NCAA Tournament coverage depending on who you ask. Gottlieb does bring more of an edge to CBS's coverage, and maybe that's the buzz CBS was hoping for when they hired him. Gottlieb's better in the broadcast booth where his blunt analysis is refreshing, than the studio where his style could lead to some interesting moments next weekend. Newcomer of the Year: Allie LaForce. Gottlieb's Lead Off co-host was introduced to the nation and did well in her first assignment for the network as a sideline reporter. It makes you wonder why CBS wouldn't try to promote Lead Off (that's a late night show starring LaForce and Gottlieb on CBS Sports Network in case you weren't aware) and CBS Sports Network instead of a million ads for Bleacher Report's team streams. I'm not saying what #FloridaGulfCoast did was impressive, but Amanda Bynes wants them to call her. Best Snafu: Florida GOLF Coast University. Best Photobomb: Julian Gamble… again. Worst Butchering of an All American's Name: Kenny Smith kept mispronouncing Indiana's Victor Oladipo's name as "Victor Olapido." This wasn't just a single occurrence, but happened pretty much every time The Jet talked about the Hoosiers. This isn't just any random player, this is a Naismith finalist. Sure it's a goofy quirk, but it's also symbolic of the disconnect between Turner's NBA talent and the college game. Worst Programming Decision: The local CBS affiliate in San Diego preempted the first portion of Saturday's Michigan-VCU game to show Saturday morning cartoons on the west coast. At least I'm sure it beats truTV's regularly scheduled programming. Not a single person who covers college basketball could coherently make this argument after watching the season (please leave your RPI numbers at the door). Yet, Barkley stubbornly played up the feud throughout the first weekend in spite of the results making a mockery of his previous proclamation. Ernie Johnson tried to get Barkley to retract his comments about the conference being overrated (with 1/4th of the Sweet 16 made up of the Big Ten), but he stammered on about the strength of the Big East, Mountain West, and the top of the Pac 12. What? Of course, maybe Barkley is making the argument because he hasn't been watching college basketball this season, or he is losing a significant sum of money betting against the Big Ten. Either way, the episode has provided another question mark for skeptics of the CBS/Turner NBA experiment. At this point, Barkley vs the Big Ten has become a storyline in and of itself, which is decent entertainment but also an unfortunate distraction. It didn't help that Barkley led the brigade in beating the debatable Aaron Craft block/charge call into the ground like it was the Soviets taking away a gold medal from Iowa State. (That doubles as the Most Tiresome Debate of the weekend by the way.) Anytime an analyst gets drawn into a provincial feud with a fanbase it takes away from where the focus should be, in this case a memorable tournament moment in Craft's game-winning shot. Here's how you know things are going bad for Charles Barkley – he's being publicly compared to Mark May by Big Ten fans. That's not a compliment. Best Call: Dunk. City. Kevin. Harlan. Weirdest Clark Kellogg Food Analogy: On Temple's interior defense… "It has been Philly cheesesteak strong with a little banana peppers on top of it!" A.) I've never thought of declaring a cheesteak as "strong" because I'm not Guy Fieri. B.) What does any of that have to do with basketball? 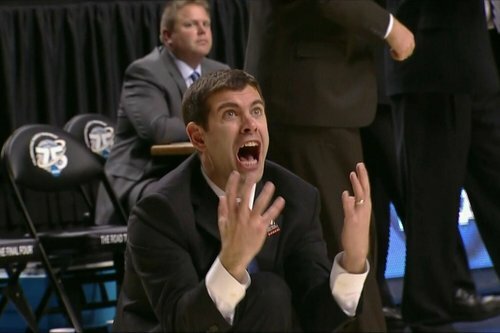 This is the face of March Madness.